My closet is filled with white lace. Skirts, blouses, dresses I do not discriminate from one of my favorite fabrics. I picked up this top at Anthropologie before my trip to New Orleans, but sadly it is sold out. 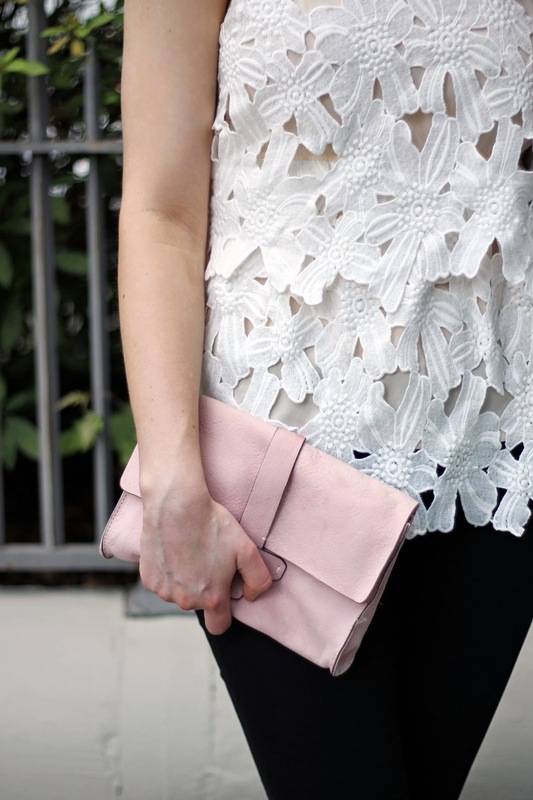 I love that the lace is tiered, and that the lining is a soft cream adding a nice dimension to the lace. I paired it with my favorite black jeans to add a nice contrast. Shop a few of my favorite white lace pieces for summer below. ONE This silk blouse would look great tucked into skirts or with a casual pair of shorts. // TWO I've had my Karen Walker sunglasses for almost 2 years now. They are such a staple that I may need to add a second pair in black. // THREE A quirky Iphone case perfect for summer. // FOUR This is my favorite lip balm. Plus, it has SPF 15 which is great for days spent outside. // FIVE A classic little black bikini. // SIX This is the midi dress of my summertime dreams. 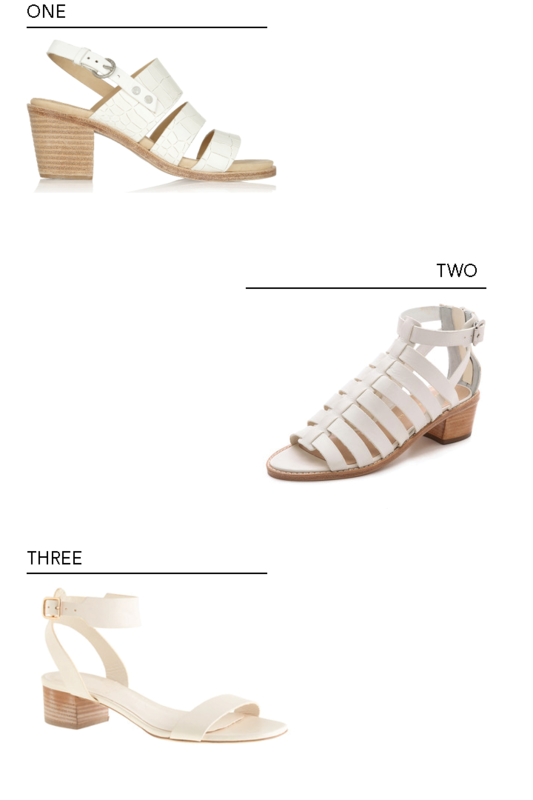 // SEVEN Cheery espadrilles for under $100. // EIGHT I started using this BB cream last summer. It goes on smoothly, and is light enough for my fair skin. // NINE This crossbody bag is currently an extra 30% off! // TEN I believe in summer scarves. // ELEVEN These printed shorts are only $20; making them an easy addition to your wardrobe. A few years ago I attempted to make scones, and I say attempted because they never made it to the oven. I blame the extreme humidity in the deep south, but I probably wasn't following directions. It was right after Thanksgiving and we had a bag of cranberries left over. I thought they would make delicious scones, but it was pretty tragic. Since then I've stuck to muffins and biscuits, but a strawberry scone was calling my name last week. Due to Charlottesville's late spring I feel like I was barely able to enjoy strawberry season. They started to fill the grocery store just before peaches and plums in May. These are great scones. The perfect balance of richness and sweetness from the cream and berries. Just make sure to use aluminum-free baking powder so that you scones do not take on a metallic taste. 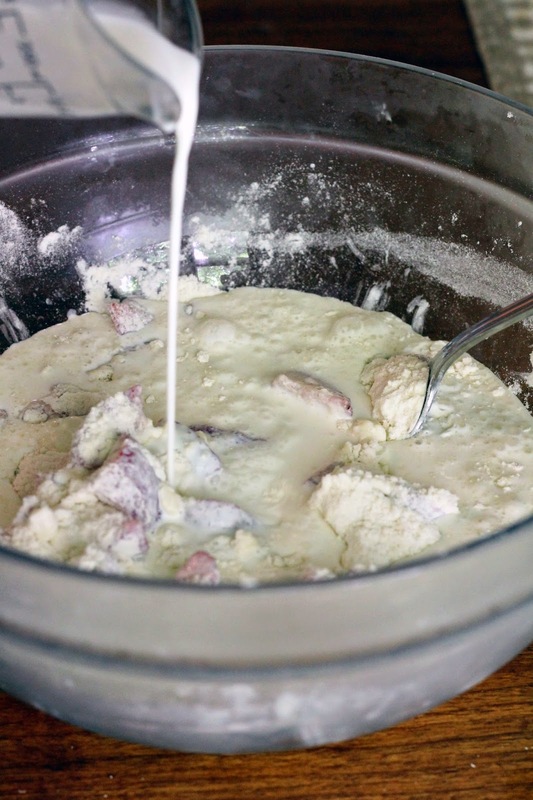 Combine flour, baking powder, sugar, and salt in a large mixing bowl. Quickly add butter (the colder the butter the flakier the scones) and cut into flour with a pastry cutter or fork until mixture resembles coarse meal. 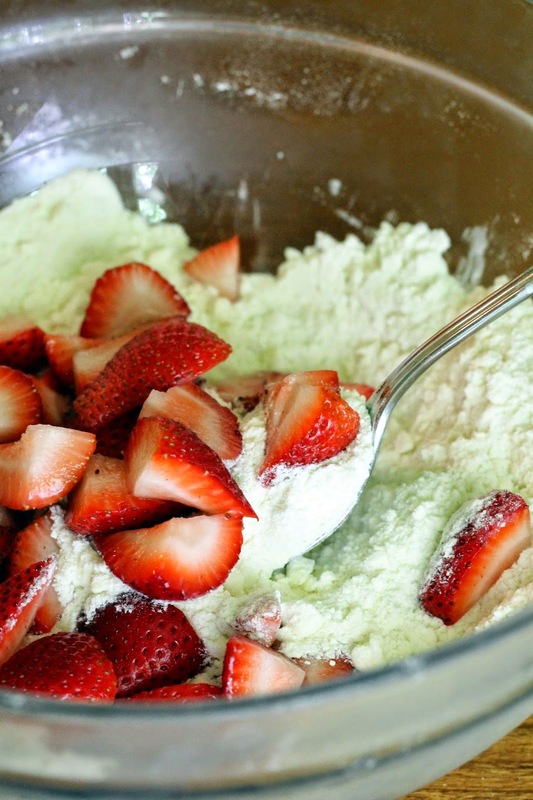 Gently stir in strawberries so they are covered with flour mixture. Pour in heavy cream and stir to combine. Dough will be sticky. Transfer dough to a well floured surface. Knead dough by hand until it comes together, and then pat into 1 inch thick circle. 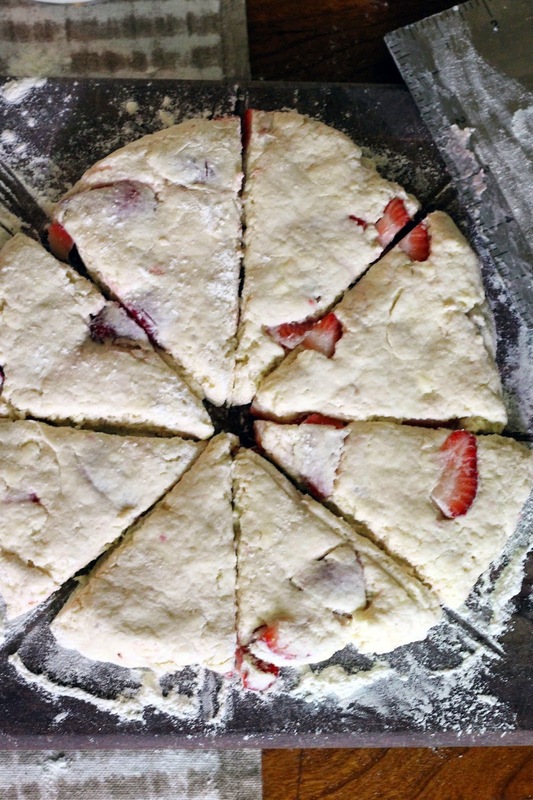 Cut scones into 8 wedges. 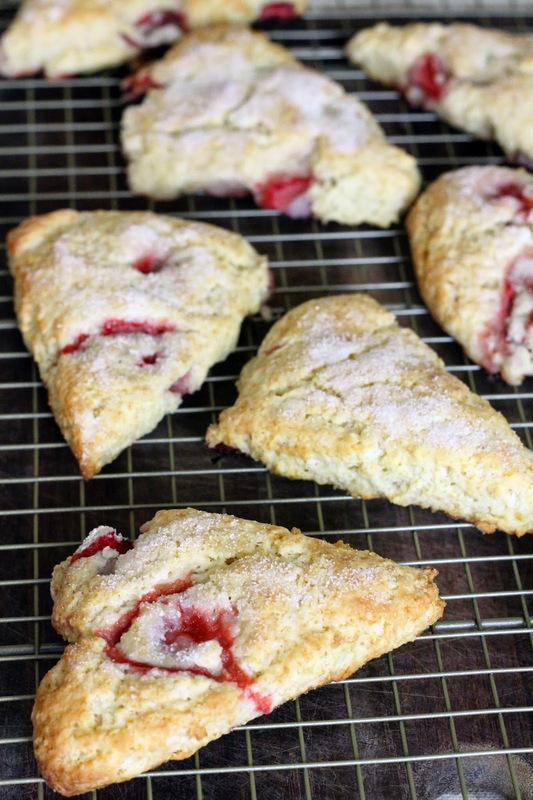 Place scones on a baking sheet and sprinkle lightly with sugar. 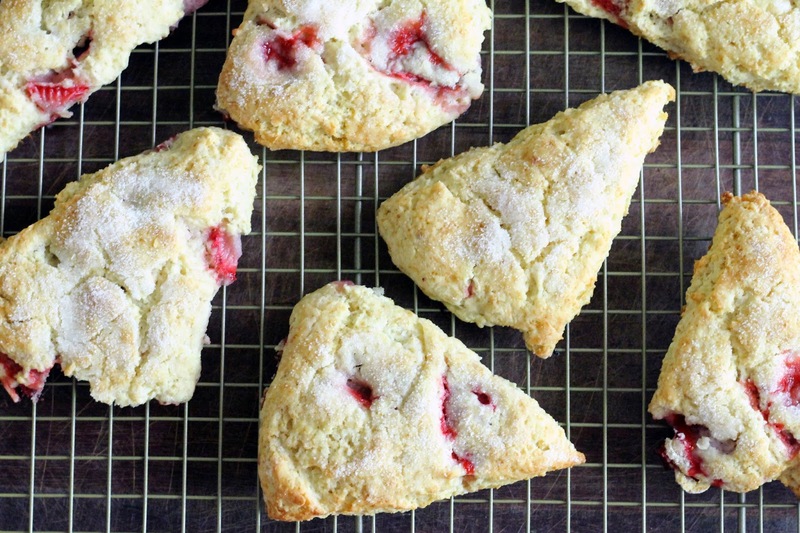 Bake scones for 14-17 minutes, or until tops are golden brown. Cool on a wire rack. Serve warm. I'd sworn off skirts the last few years. I found them difficult to style and rarely had the right occasion to wear them, but I've recently changed my tune. I bought this skirt at Anthropologie a few months ago and it has become a wardrobe staple. Because of its neutral stripes I can pair it with almost any top easily taking it from day to night. I wore this outfit while in New Orleans and it was perfect for po-boy eating and a little day drinking.